the quilt above is not one of my quilts nor is it one of the most artfully constructed quilts I've ever seen, but the story of this quilt is one of my favorite quilt stories. and because it has such an interesting story, with so many wonderful life lessons, I believe it is one of the most beautiful quilts I've seen. I love to quilt and came to quilting quite naturally as I come from a long line of "women of the cloth." one of my earliest memories is of playing with my cousin under the quilting frame at my grandmother's house waiting for the call to thread more needles. I made my first quilt in the mid 1970s while on a college break. I discovered my mother's scrap bag and constructed a very simple quilt composed entirely of fabric scraps from clothes that my mom made for my sister and I.
after my first quilt my quilting fairy went into hibernation until 1990. unlike mrs. heintz, I started and completed my first quilt in a timely manner and went on to make many quilts from 1990 until the present day. although I pride myself on finishing quilts, I have several quilts that have been 'under construction' for a while, but I hope none of these quilts will rival the length of time mrs. heintz's forever quilt was in progress. 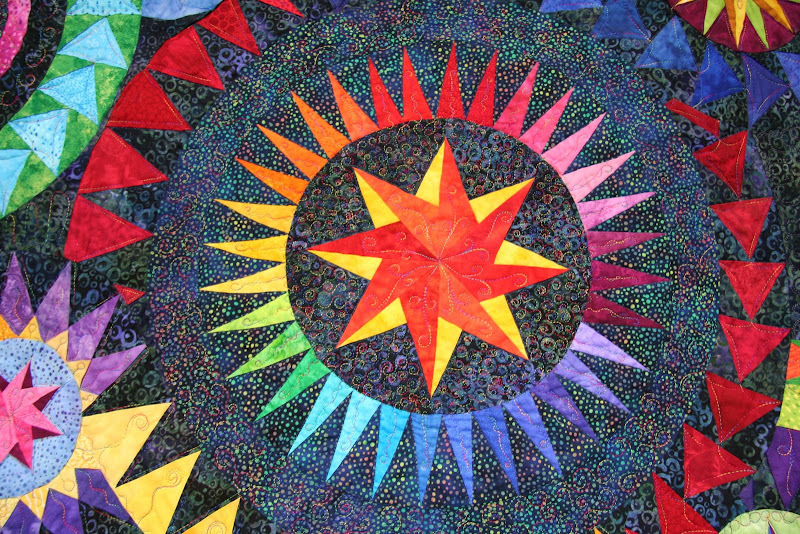 I enjoy making quilts that celebrate or commemorate special events in people's lives. I have made quilts that mark the entire cycle of life from birth to death I also volunteer my quilting fairy to help raise awareness about the tragic occasions when birth and death collide as I am part of a circle of quilters who contribute blocks to the safe motherhood quilt project. 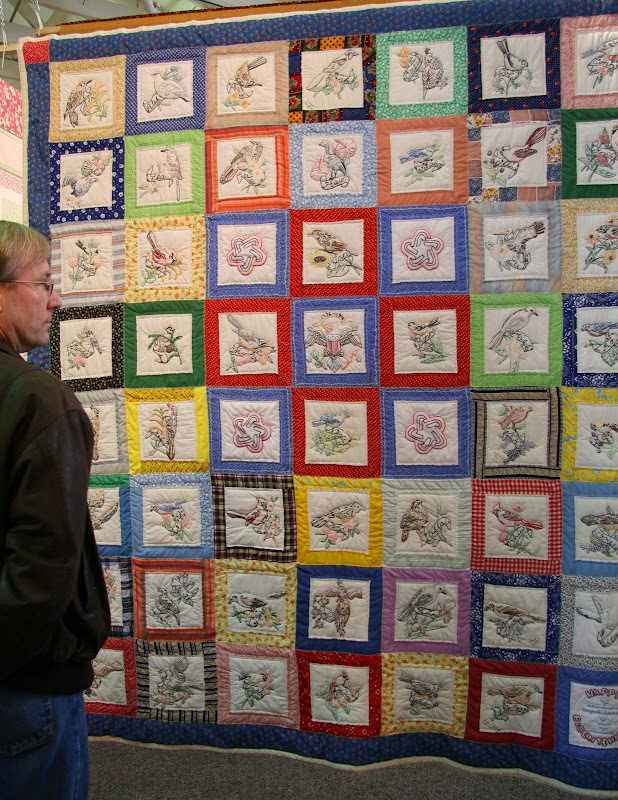 detail of a beautiful award winning quilt from the 2008 quilt show at the farmpark. That award-winning quilt is exquisite! Absolutely beautiful work. I confess, as one who only knows that a needle as a sore end and a slightly less sore end, I've never quite got quilting, or anything that involves needles and threads! The Forever quilt is so beautiful. I would love to have it! I like that the fabrics are not modern, too. Do you have trouble finding fabric that is not made in C****? Gorgeous. And the forever quilter lived in MENTOR, Ohio? Wonder how the town ever got such a name? I loved looking at the quilts. Thinkg the rainbow fishies are great and so is the quilt made of favorite shirts of a loved one. Mentor Ohio is named after the Greek figure Mentor, in keeping with the Connecticut Western Reserve settlers' tradition, as well as that of most other Americans at the time, of celebrating aspects of Greek classicism (nearby Solon, Macedonia, Euclid, and Akron also were named using that principle). I have a stack of those state birds that my grandmother had. I embroider on them from time to time . . .
Beautiful quilts and I love the story. Unfortunately quilting is not so big here in the UK, though I have a friend in Scotland who makes fabulous ones. One of my fridge magnets, which I picked up on a trip to Atlanta, bears the motto: When life goes to pieces, try quilting. Quilting is interesting, even for me on the sidelines, for the way an object encapsulates both utility and a story. You have shared a particularly interesting one there. On the utility side, I imagine that quilts were/are really important for surviving the harsh continental winters you have. av - the award winning quilt blew my mind - perfect points - intrestingly the top quilting wasn't done by hand by by machine...this is the biggest change I've seen over the years is the ascendancy of the machine quilting. I - unfortunately or fortunately - still quilt by hand. ched - personally I buy fairly pricey fabrics and they are NOT made in c**** - my most important issue is quality and will not buy crappy cloth! rlb -thanks for always adding more levels and layers of information! look forward to the links! bob - I almost posted about quiches!! I do make quiches and love to play with different types of quiches... as a pie girl I am both sweet and savory! when we lived in new haven we had a quince tree at one of our flats and I tried to make quince jelly - it was AWFUL! tut - they were the rage....what a treasure!!! betty - wise advice on your magnet! coffee - I do love the way quilts will give for as long as a remnant remains....I remember you writing of a wonderful quilting friend. My sister and I made a patchwork coverlet (not properly quilted tho) which took years and years - but was finished (more by chance than by design) just in time for my parents 40th anniv.